← ROBYN SAMPSON. Ending child immigration detention is just a matter of time. Consumers are understandably annoyed about recent electricity price rises. But that does not mean they would necessarily react negatively to a price rise associated with adoption of the Finkel Report recommendations. People are more likely to accept a price rise serving a public purpose than a price rise flowing through to rent-seekers and paying for bureaucratic overheads in the electricity supply chain. You find that on its last service, your car’s muffler was not properly attached. It is now damaged and has to be replaced. The garage that did the service denies responsibility. Now write down, on a scale of 0 to 10, how upset you would be in each situation. Students typically respond with a range of responses, depending on the context of the loss. The exercise may seem to be no more than an illustration of the obvious, but it exposes a shortcoming in the way governments and some journalists view human behaviour, as if we judge all government policies in terms of a one-dimensional dollar metric, devoid of any moral context. Post-budget media reports reveal this way of thinking, reducing households’ gains and losses to a single dimension with headlines such as “average household $X worse off a week”. But there’s far more to our reaction than the single bottom line. We care about how we’re treated and how we treat others. Electricity billing needs to be seen in its moral context. People are understandably annoyed about electricity price rises. 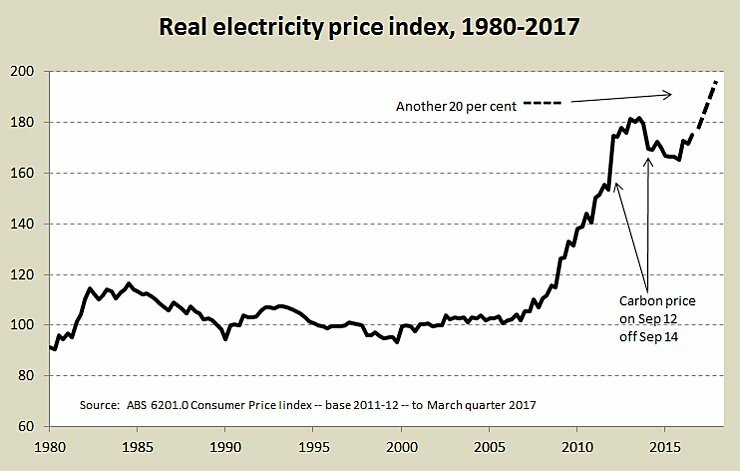 Over the ten years to March 2017 real (inflation adjusted) household electricity prices, after remaining stable for many years, have risen by 75 per cent, as shown on the graph below. The recently-announced price increases will push prices to the top of the scale, rendering Gillard’s carbon tax and its repeal by the Abbott Government as mere blips on the upward trend. The big jumps in prices that occurred up to 2012 were associated with privatisation and development of the “National Electricity Market” (NEM). While some price rise was inevitable, much of the rise has been a result of generous treatment of the owners of network assets – the “poles and wires”. The regulatory structure of the NEM has encouraged them to over-invest in those assets and then gives them a generous allowance for a return on capital. Also, in the name of “competition”, the NEM has imposed a group of “retailers” in the supply chain – financial intermediaries who absorb 25 to 40 per cent of households’ electricity bill. The recently-announced round of price rises continues this generosity to the network’s owners. It also results from supply reductions (the closure of three old coal-fired stations) and a shortage of gas. When an important commodity is in short supply, its owners are in a strong position. Politically there is plenty of blame to go around for the current situation, but most can be sheeted home to the Coalition, in particular to Tony Abbott, who to this day has been doing everything he can to thwart a transition to a low-carbon electricity supply, thus stymieing new investment. Labor’s contribution was its gung-ho approach to gas exports during its time in office, failing to anticipate probable domestic shortages as old coal power stations were to close. In a role reversal that would leave John Curtin, Ben Chifley and Gough Whitlam in wonder, the Coalition’s failure was to reject a market solution, while Labor’s failure was to leave the market too unregulated. Both main parties, however, have to take responsibility for creating the privatised behemoth known as the National Electricity Market. There is an opportunity to learn from those failures. Importantly the Gillard Government failed in another way when it offered “compensation” for the carbon price. “Compensation” is something we give to those on whom we have inflicted suffering or injury. No government should “compensate” people doing their bit to meet “the greatest moral challenge of our time”, to quote her predecessor. Imagine how you would feel if your neighbour has been unwell, and you have decided to mow her lawn. A week later she knocks on your door and gives you $20 – and an invoice – as “compensation”. Or on a public policy level, imagine that Commonwealth were to abolish the Order of Australia and related honours, replacing them with cash grants for civic services. Gillard got it seriously wrong, but perhaps my classroom experiments offer some insight into why she did, for a handful of students just couldn’t get the message of the $500 exercise: they simply gave every event the same subjective score. These outliers, I wouldn’t be surprised, were public servants in central agencies such as Treasury or Finance. People may rightfully resent paying a high price for electricity if they see it financing the undeserved profits and executive salaries of privatised and foreign-owned utilities, or the bureaucratic overheads of “retailers”. But at the same time they may be accepting of a price rise if it’s linked to our contribution to dealing with climate change. They obviously don’t like parting with their money, but they also care about where it is going. Also, in a point overlooked in the current debate, no one wants people to accept a price rise and to grin and bear it. A price rise is supposed to change behaviour. It would do nothing for the planet’s climate if we were simply to pay high prices without reducing electricity consumption. Many journalists, either through laziness or a partisan bias, fail to distinguish between electricity prices and electricity bills. Ideally a price rise should see a smaller rise in our bill, or even a smaller bill. That means, rather than refraining from implementing the Finkel recommendations or offering “compensation”, governments would do far better to reform the NEM. The NEM has worked to pass on price rises to the most vulnerable customers – particularly in the form of rapidly-rising fixed supply charges – and has thwarted the development of market and technological mechanisms that can help consumers to reduce electricity use without suffering hardship. A winning strategy for the Commonwealth, therefore, would be to cut the fat out of the companies benefiting from the permissive rules of the NEM – by legislating to reduce their return on capital to a reasonable level or by re-nationalising the industry and realising the benefits of vertical integration (while leaving generation privatised and competitive). That would provide a lower cost base upon which a carbon price could be added, which could be used to help households and businesses reduce their consumption and to make their use better-matched to the way renewable energy operates (for example the plentiful supply of rooftop solar in the middle of clear days). Whatever governments do in response to Finkel, they must take the findings of behavioural economics into account. People care not only about the “bottom line”, but also about the legitimacy of their private and public transactions. Ian McAuley is an Adjunct Lecturer in Public Sector Finance at the University of Canberra and a Fellow at the Centre for Policy Development. In their work Governomics – can we afford small government? Miriam Lyons and Ian McAuley explain the economics of electricity and similar utilities, demonstrating the case for keeping them in public ownership and control. To use market mechanisms to operate our energy grid may well be a good idea, but given that government has a responsibility to provide a satisfactory outcome, and since the rules of the market are entirely the creation of government, it seems obvious that there needs to be one or more government bodies with the resources and the authority to address the technical and economic issues involved. The problem, it seems to me, is that such body or bodies do not exist. It’s a national issue, but there’s no Federal Government department to take responsiblity, so it falls to COAG, which is nothing more than a meeting, and COAG’s Energy Council, which is another meeting, to somehow make thing right. It’s a hollow system which can’t get out of its own way, so this artificial market continues to be run for the benefit of the participants. Finkel either doesn’t see it this way, or has decided to produce a report which causes the least disturbance, such as adding another meeting, the Energy Security Board. And in the absence of any responsible body with expertise and authority, we’re left with ignorant argument and left field proposals, like Snowy 2.0.